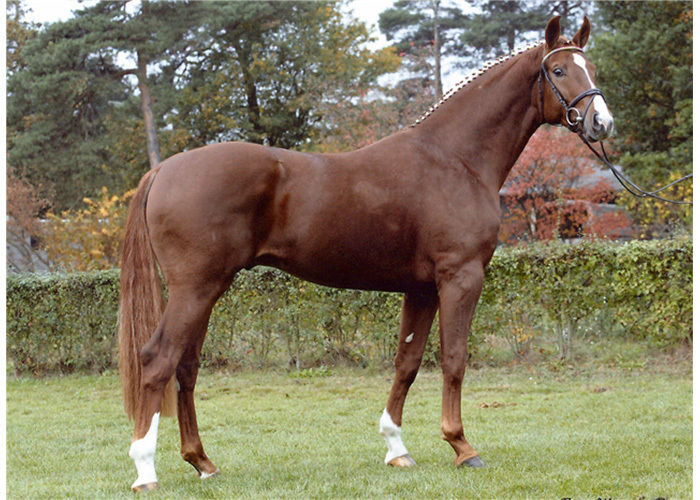 Sire, Belissimo M, did his 30 day test in 2002 in Zweibrucken, with a final score of 9.63 for dressage and 8.77 for jumping which was the highest score ever given at a 30 day test. He was given the score of 10 four times. He was the most expensive horse at the 2002 NRW fall auction in Munster-Hahndorf. In 2003 he became Bundeschampion of 4 yo stallions in Warendorf. The following year he won a division of the final qualification at the WC in the 5 yo class in Verden with a score of 9.38 and then took 5th place in the final. In 2005 he took the Vice Bundeschampion title for 6 yo horses after clearly winning the final qualification. He is trained to S level. As a sire he continues the popular Bolero line. Several of his offspring from his first crops were sold for the highest prices at the Verband auctions in Munster-Handorf and Verden. In 2004 there was much excitement when three of four sons presented at the licensing were licensed! Two sons received a premium. His latest achievement was in 2007 when Bootsmann became the second Reserve Champion at the Southern German licensing in Munich. 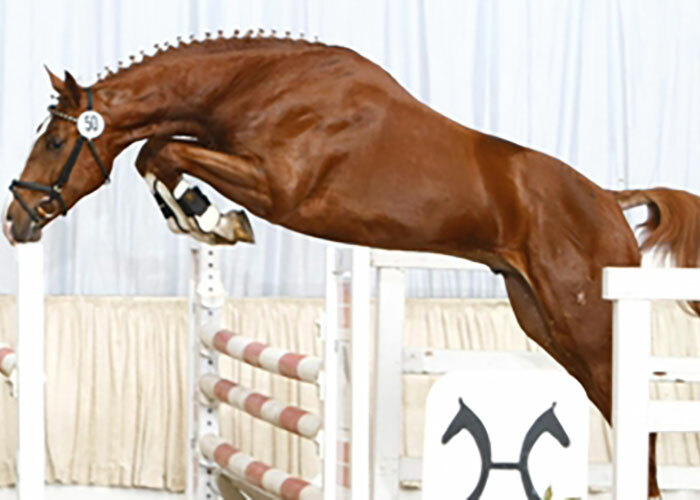 Damsire Wendekreis has two leading sires of show jumpers in his pedigree: Ferdinand and Domspatz. 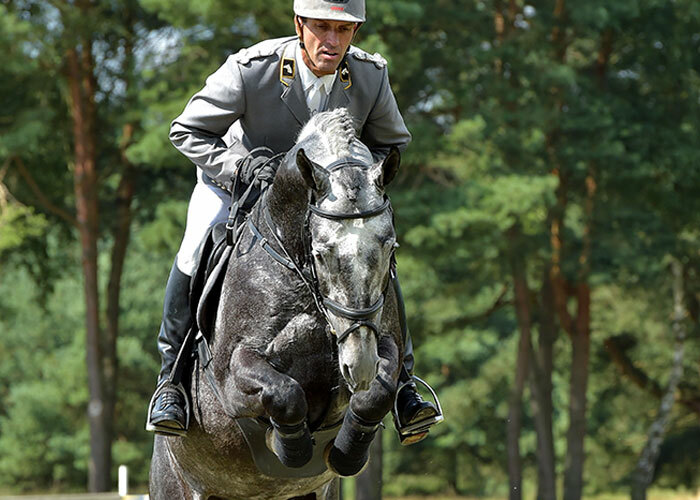 The offspring of these two stallions have been among the greats in German show jumping for many years and his offspring have won a huge amount of money. At his performance test Belafonte impressed most of all with his securely balanced trot, which was engaged out of the hindquarters, while the back was nicely swinging. The canter was also very pleasing; clearly uphill, jumping through over the back. The test riders felt comfortable and scored the rideability far above the average. He gained 8 for character, 9 temperament, 8 willingness to work, 8 conformation, 9 trot, 9 canter, 8 walk, 9 rideability and averaged 6’s for jumping categories. In free-jumping he was given 7.5, jumping manner 7.33, technique 7.67 and 8.67 rideability over jumps. He came first overall in his year out of 52 stallions tested and first overall in dressage ability. 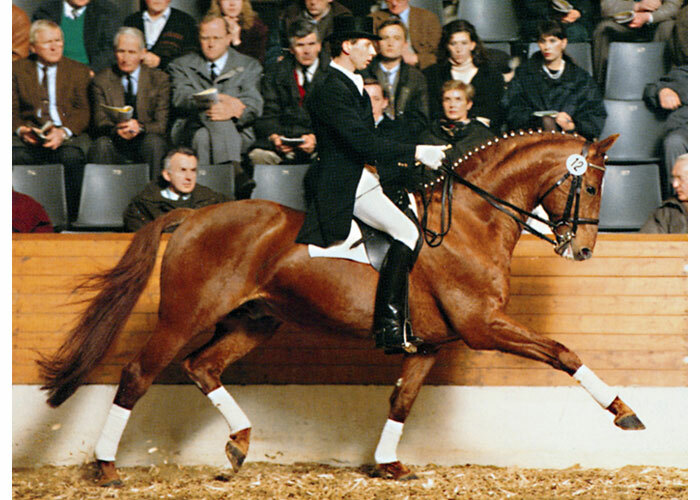 Belafonte carries the important genes of both Bolero and Wendekreis which combine to produce a sire of excellent dressage qualities.